Closed down the Guyana campaign after more than 3 months, at the request of the ICEM. This campaign had 2,685 supporters in the end. The Polish language RSS newswire seems to be working again – getting this confirmed. We now have a conference poster. Thanks to the efforts of our friends and comrades we should shortly be launching some of our campaigns in Korean and in Arabic. As Arabic is estimated to have anywhere between 150 – 250 million native speakers, and Korean to have 60 – 78 million native speakers, these are hugely important developments. More details coming soon. In the course of updating LabourStart news this morning I stumbled across the incredible story of 3,500 miners in Peru standing up to an American-owned company, blockading roads, confronting police and troops, risking their lives to save their jobs. And it reminded me of how we gather news, and what we do with it, and why LabourStart’s news-gathering is so different from automated news aggregrators like Google News. First of all, we can use human intelligence to follow a story by first searching on obvious terms like “strike”, but then focussing on the name of the town (La Oroya) and the company (Doe Run). And we can tell what’s a credible news source (AFP) and choose to lead with that. And we know to search immediately to see what the relevant global union federation (ICEM) is doing. And when we see that it doesn’t have anything yet on its website, we can write to them to point this out. There are already reports of some injuries in La Oroya, which can lead us to escalate our coverage, to try to get statements from other mining unions, to involve NGOs like Amnesty International, and if needed, to launch an online campaign. These are just some of things that make our news coverage different because we’re activists and trade unionists with experience and knowledge — something that no press clipping service, however sophisticated, can offer. Three old campaigns have reached their “sell-by” date and I thought I’d let you know how we cope with this. The Seher Tumer campaign (Turkey) has been extended a bit due to the very late translation into Turkish. We want to give the Turkish comrades a chance to show their support. The union in Guyana asked us today if we could extend the campaign, and I agree to do so for a month. And I’ve just written to the UE asking if we can now suspend the 3-month old Mexico Pemex campaign. All the other campaigns are two months old or less. It’s not always easy to determine who is actually responsible for a campaign as sometimes we’re approached by several different GUFs or national unions and NGOs, and then when we do identify who’s in charge, getting agreement to close a campaign down is not always easy. Still, it’s important that we do this, as we want to keep our (very long) list of active campaigns short and up-to-date. We’ve launched a new campaign in support of striking Dis-Chem workers in South Africa. A campaign in support of Mexican workers in Cananea may come online next week; we’re liaising with ICEM about this one. We now know for sure of over 100 people attending our conference — with two thirds of them having paid registration fees in advance. My latest Labour and Technology podcast is now online, here. In Africa, we’ve once again been asked by SACCAWU to help out in a dispute with a company. In Asia, we’re been approached a number of times around the arrest of a Thai labour activist. The Clean Clothes Campaign has already launched this as an online campaign so we need only link to them. And within the last ten days, we’ve launched our Apple/Foxconn campaign in China and at the request of the IUF asked people to support their West Bengal (India) tea workers campaign. Increasingly we’re forced to refuse help on the grounds that we need to stay focussed on workers rights — dealing with jailings and killings of trade unionists in particular — and cannot take up every difficult employer, for example. It’s not always easy to make these decisions. In light of this, I suggest we consider adding a sentence to what we have published online. 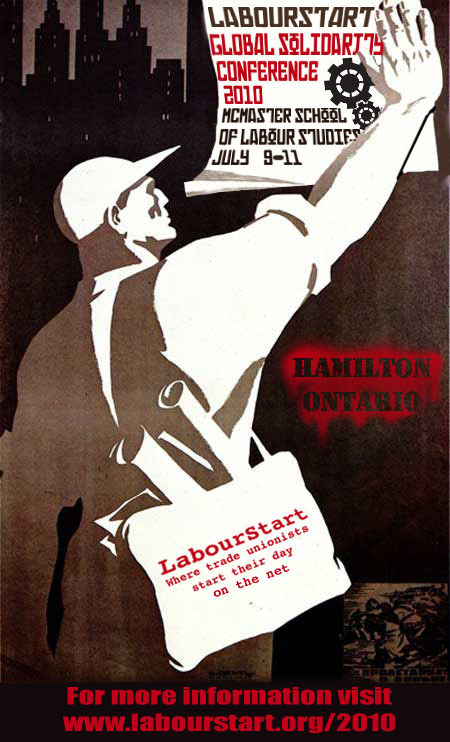 LabourStart runs online campaigns at the request of trade unions around the world. Our preference is for campaigns to be submitted by global union federations, national trade union centres and national unions, but will in some circumstances accept campaigns from local and branch unions. We do not normally accept campaigns submitted by individuals or NGOs which are not unions. Campaigns which would benefit from global exposure and support are more likely to be approved than campaigns that will be of no interest outside of your locality or country. Our campaigns run for three months and if the issues are not resolved by then, LabourStart reserves the right to suspend the campaign. Unions which request campaigns from us are expected to keep us updated and to promote the campaign to their own members and others. We never charge unions for running these campaigns and the service will always be free. Campaigns which focus on violations of workers’ rights are more likely to be adopted than campaigns in support of everyday issues which arise in relations with employers, such as problems negotiating a collective agreement. Our conference is now 34 days away. We have 204 registrants of whom 58 have paid their fees — for a total of C$8,252. The conference website is now located here. I have spoken about the conference in my weekly “Labour and Technology Podcast” – click here to listen.